I have added this page to help show my students and others learn how I instruct the steps of cutting the proper cabochon. There are several parts to a cabochon. The outward shape looking at the gem from the top is called girdle. Just above the girdle in the SIDE view is called the shoulder which is like our own shoulders, rounded. These shoulders lead to the top of the dome called the table. 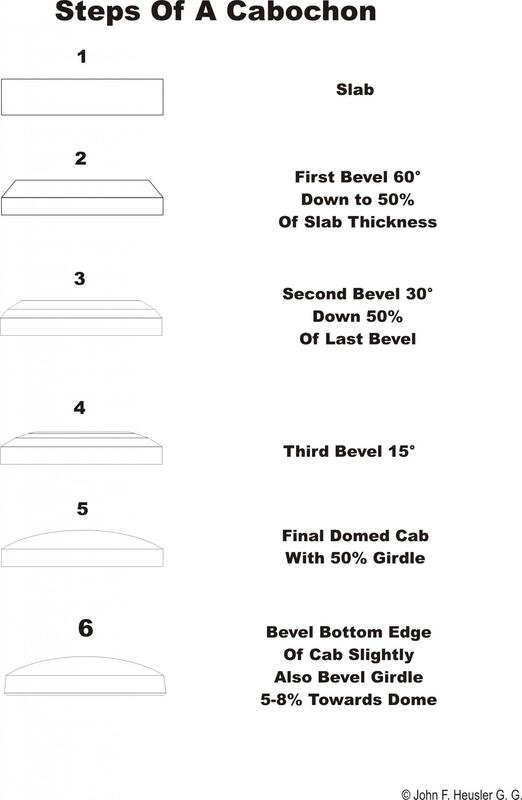 Notice the last step shows the girdle slightly tapered towards the top of the stone 5 - 8%. If the proper bezel is built and near zero gaps have been achieved between the bezel and the stone AND the stone slips in and out well without distorting the shape of the bezel then there will be very little effort in setting the gemstone. All that is needed is to roll the bezel over the edge of the shoulder. This technique should not take 5 minutes total to set it, no matter what the size of the stone. Note that this information above is for a standard bezel of 1/8" x 26 guage. The same diagram for cutting a gemstone would be used for a heavy bezel but those must be chased in with a bezel punch and chasing hammer. Tapering the girdle allows the stone to be locked into place. Using a straight girdle (90° to the bottom of the stone) no matter how much pressure you put on the bezel to hold the stone it will come loose and or fall out. Maybe not right away but it WILL happen. More diagrams and tips to follow.